Changes. Big changes are coming in 2017! The DVD & Blu-ray Release Report has covered the market for the past 21 years and has been a first-hand witness to the shift from VHS (and laserdisc) to DVD, the arrival of Blu-ray and, lately, the addition of the 4K Ultra HD format. There is, however, one area that we’ve given short-shift to over the years, and that is the world MOD (DVD-R) for both DVD, and to a lesser extent, Blu-ray. The initial reason for ignoring DVD-R as a full-partner in the SKU count was related to piracy. Some well-meaning film fans, early on, were frustrated with the selections that the Hollywood studios were concentrating on for their DVD releases. Missing from the studio mix were the likes of B-Westerns, serials and other films that they, the studios, saw little merit in releasing. So these film fans and film buffs simply took matters into their own hands and began generating DVD-R releases of their favorite films for other film buffs, like themselves, to purchase and enjoy. Notifying certain studio contacts about this activity became a whack-a-mole pursuit that was time consuming — there were simply better things to do than rat-out some fly-by-night film operation putting out Charles Starrett Westerns on DVD-R discs. As the market matured, funny things happened along the way that surprised the studios with the new DVD format. Example, on VHS you couldn’t give TV programming away, but on DVD it became a major revenue stream. Wow, that came as a major surprise. And, the studios soon learned that they were competing against themselves when it came to film catalog releases. To this latter point, no one in their right mind would buy a used VHS cassette from Blockbuster (back in the day), but they had no problem snapping up re-priced and newly minted versions of the same movie on VHS. The studios were happy campers (I speak from experience, having run marketing for one them) as they could sell high-priced rental VHS copies and then wait a bit and reissue lower priced versions of the same product (a true double-dip). DVD, however, was a horse of a different color. A used DVD, sold on Amazon.com for example, turned out to be just as good a brand new version. This created a nightmare for the studios in terms of catalog management. The initial releases were showing up as used copies for sale, more often than not at lower price points, and that meant that there was a greatly diminished after market for marginal titles and deep catalog. It also meant that warehouses were filling up with unsold product and that’s an inventory no-no. The solution was MOD, or Manufacturing on Demand. How do you convince people that a MOD is just as good as a professionally replicated DVD disc? That was a challenge, but over time this “challenge” has been overcome, especially when the only way to obtain certain golden treasures was to bite the bullet and buy a MOD. This brings us full circle back to the changes that are afoot for the DVD & Blu-ray Release Report during the early months of 2017. The number of commercially replicated DVD SKUs has taken a dramatic drop over the past 18 months, which has created the illusion that the entire DVD market is on the verge of collapse. That simply isn’t the case, as the total number of new releases being generated each week has remained relatively constant. Instead, we are witnessing a shift from mass replication of DVD and Blu-ray products to more and more MOD releases. Inventory control is at the heart of this shift and by not properly documenting both professionally replicated and MOD new releases, we are contributing to a false narrative of what is actually taking place in the market these days. While certain sponsors of the DVD & Blu-ray Release Report have had their product (both replicated and MOD) reported on and documented over the past ten years (or so), others have been ignored. The ones that were reported on will simply be shifted into the MOD category and will not affect the overall SKU counts. However, during the next three months, the various databases will be corrected to properly reflect what has taken place with respect to previously unreported MOD activity. This will be dramatic, so don’t get freak out when you suddenly see huge jumps in previous years … it will balance out, and an accurate portrait of the home entertainment market will be the result. The source of the MOD activity must be readily identifiable. That means these sources must have a dedicated website. Dates of initial release for each MOD must be verifiable. The film product cannot be pirated. PD is fair game, and certainly MOD releases of how-to product offerings, or religious teachings, etc. are all prime candidates. But if a title is clearly being pirated (Song of the South is a prime example) it will not be included in the various databases that the DVD & Blu-ray Release Report maintains. Piracy of copyrighted product is not condoned. Lastly, it is not our concern as to the “quality” of the product being offered. We’ve seen, over the years, some real “crap” released on DVD (truly an embarrassment), but if the MOD product being offered meets the aforementioned listing criteria, it will be included in the revised mix. Sponsors (advertisers) always get first crack at the available space in each edition of the report. All content is reposted to our business blog. All business blog postings immediately (with content tags) appear as Google-Plus entries. We are rapidly approaching the 12 million mark in terms of consumer reader hits. All new theatrical films that gross in excess of $25 million are covered. They drive the market. Remaining coverage is based upon space available. All other new announcements are line listed in the appropriate DVD and Blu-ray sections during the week they are added to the various databases (often that is during the week of release). Lastly, any MOD supplier who wishes to have their product line-listed, or covered editorially, please feel free to contact the DVD & Blu-ray Release Report with title information (including dates and pricing). Mill Creek Entertainment announced an 18-strong selection of priced-to-collect DVD and Blu-ray product offerings that will be retail-ready during the month of February. They arrive in back-to-back release waves on the 7th and 14th of the month. 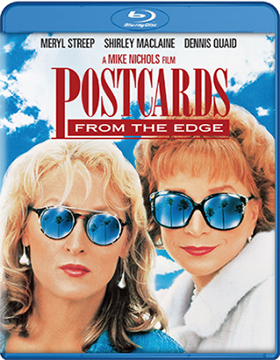 Leading the charge on Feb. 7 are both Blu-ray and DVD sets of Quantum Leap: The Complete Series and a newly-minted Blu-ray edition of director Michael Nichols’ 1990 film adaptation of the late Carrie Fisher book, Postcards from the Edge, starring Meryl Streep and Shirley MacLaine as thinly-veiled versions of Fisher and her mother Debbie Reynolds. 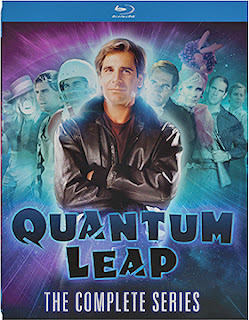 As to the Quantum Leap: The Complete Series, all 97 episodes of the Emmy-winning sci-fi program, starring Scott Bakula as the time-jumping scientist who is trying to get back to the present day, are included in both the DVD and Blu-ray packages. 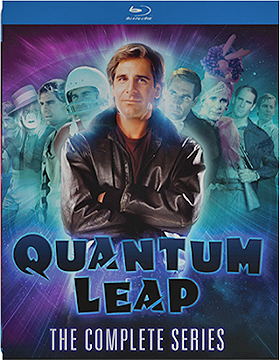 Bakula is aided by Dean Stockwell, his friend in the present day, who materializes as a holographic image and provides him with important information about his most current time-jumping predicament. Also on the TV-on-DVD release front on Feb. 7 is 227: The Complete First Season, a double-disc set featuring all 22 episodes from the 1985/86 broadcast season. The series stars Marla Gibbs (fresh from The Jeffersons sitcom), Hal Williams and Regina King, the Jenkins family who live in the apartment building at 227 Lexington Place (hence the name of the series) in Washington D.C. Jackée Harry was also a resident of the building and the best friend of Brenda (Regina King), the Jenkins’ teenage daughter (Jackée Harry won an Emmy for Best Supporting Actress during 1986/87 season). Also on Feb. 7 is the double-disc collection of It's Ernest: The Complete Series, starring Jim Varney as the iconic Ernest P. Worrell. This Saturday-morning kid show ran for 13 episodes during the 1988 broadcast season (from just after Labor Day right up until Christmas Eve of that year). On the film-collection release front for delivery on Feb. 7 are three separate multi-film sets. The first of these is titled the 4 in 1 Latin Love Collection and it contains four films and is priced at just $9.98. Included in the mix are Living it Up (2000, starring Salma Hayek and Carmelo Gómez), I Like it Like That (1994, with Lauren Luna Vélez, Jon Seda, Rita Moreno and Griffin Dunne), Yellow (2002, teaming Roselyn Sánchez with D.B. Sweeney and Bill Duke) and Passionada (2002, starring Sofia Milos, Emmy Rossum and Jason Isaacs). 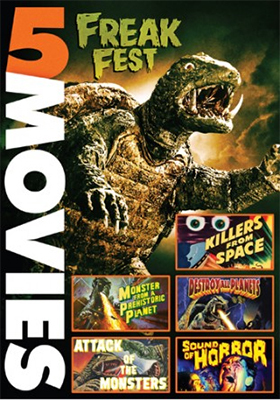 Also priced at just $9.98 for deleivery on Feb. 7 is the five-film collection titled 5 Movie Freak Fest. Featured in this sci-fi themed collection are director W. Lee Wilder’s 1954 alien-invasion thriller, Killers from Space (starring Peter Graves), the 1966 Spain-produced import, Sound of Horror (dubbed in English and released the same year theatrical by Europix … noted for featuring Ingrid Pitt among the cast members) and a trio of Japanese imports (dubbed in English) — Monster from a Prehistoric Planet (1967, featuring Gappa, a fire-breathing cousin of Godzilla), Destroy All Planets (1968) and Attack of the Monsters (1969), both starring Gamera (the flying turtle!). Road of No Return is a ten-film, double-disc collection that is loaded with action and priced to sell (the SRP is just $9.98). Included in the mix is the collection’s title feature, Road of No Return (2009, teaming Michael Madsen and David Carradine). Other films in this action-laced collection are: Without Warrant (2013, a crime thriller from Australia starring David Barry and Andy McPhee); Krews (2010, with Brian Geraghty and Jonathan Cake); Burning Daylight (2010, an interlaced modern-day telling of three Jack London short stories); Tunnel Vision (2012, starring Cristos); Open Gate (2011, teaming Tyler Hoechlin with Agnes Bruckner); Suspicion (2012, teaming Brad Blaisdell with Brad Blaisdell and Aidan Bristow); Twenty8K (2012, the streets of London run red with blood … starring Parminder Magra, Jonas Armstrong and Nichola Burley); The Killing Jar (1997) and Crosshairs (2013, starring Tom Sizemore). 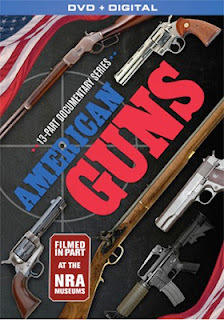 There are three multi-part DVD programs also on the Feb. 7 release docket that include, as a bonus, Mill Creek Entertainment’s newly-launched streaming platform. “Purchase, Redeem and Stream” on Amazon Fire TV, Apple TV, Roku, desktop or mobile viewing platforms (Watch.MillCreekENT.com) … These are: American Guns (available on both DVD and Blu-ray) is a 13-part series exploring the history of firearms in the United States (from the Kentucky Long Rifle to the weapons developed for World War I, World War II and Vietnam); American Warrior (two separate documentary series focusing on combat action in Iraq and Afghanistan) are included with this selection — Outside the Wire and Sniper: The Unseen Warrior — and The Evidence for Heaven contains not one, but four programs that investigate biblical stories … these are: The Evidence for Heaven (hosted by Jerry Rose), The Bible's Greatest Miracles: The Proof, Miraculous Messages and End Times: How Close are We. Rounding out the Feb. 7 release package is director Ken Cameron’s 1994 Emmy-award winning film adaptation of the Allan Gurganus novel, The Oldest Living Confederate Widow. An all-star cast includes Diane Lane, Donald Sutherland, Anne Bancroft, Cicely Tyson, Blythe Danner, Gwen Verdon and E.G. Marshall. 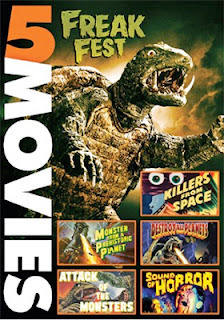 Shifting to Feb. 14, we find two addition DVD releases with the Digital Copy bonus from Mill Creek Entertainment. These are: the four-disc collection of Liberty's Kids: The Complete Series, with none other than Walter Cronkite as the voice of Benjamin Franklin, and producer Chuck Neff’s SaltRiver Productions presentation of Perfect Sacrifice: When Heaven Comes To Earth, which includes two bonus programs — The Case for Christ's Resurrection and Jesus: The Evidence. Rounding out the Feb. 14 selections are director 1997 film adaptation of Janice Woods True Women: The Complete Mini-Series (covering the period from Texas Independence through the Civil War), starring Dana Delany, Annabeth Gish and Angelina Jolie (among others) and the four-film collection titled Life in a Small Town. Included in Life in a Small Town are: writer/director Tim McCanlies’ 1998 film release of Dancer, Texas Pop. 81; Falling from Grace (1992, with John Mellencamp and Mariel Hemingway); Lone Star State of Mind (2002, teaming Joshua Jackson with Jaime King) and Off the Map. 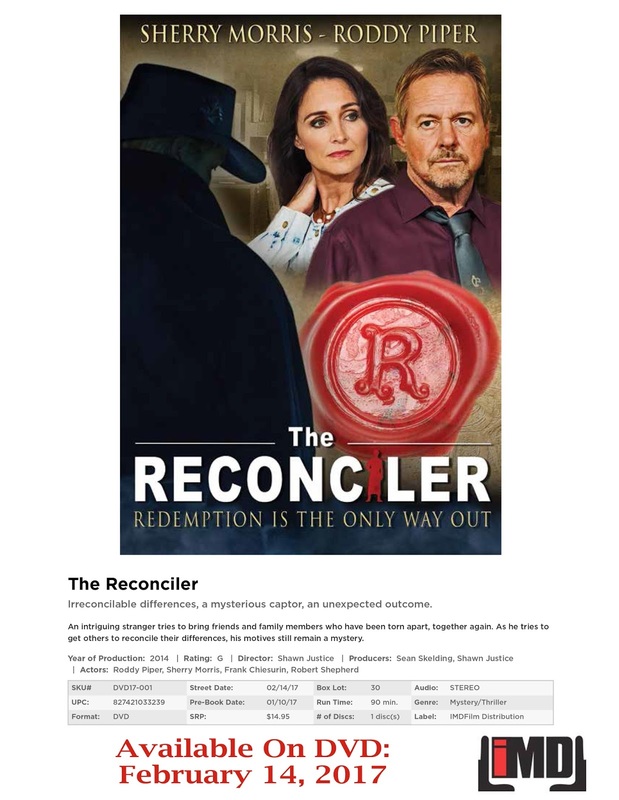 IMDFilms, with sales and distribution expertise provided by MVD Entertainment Group, has selected Feb. 14 for the DVD release of writer/director Shawn Justice’s The Reconciler. This Dove Family Approved faith-based film offers a clever twist on what appears to be traditional horror/genre-themed film elements. We find two seemingly ordinary people trapped in an abandoned warehouse, who are then informed that they have enough food and water to survive roughly seven days. That sure sounds like a horror film … what comes next? Does one of then have to kill the other — like a gladiator contest — to escape? No, it is exactly the opposite. 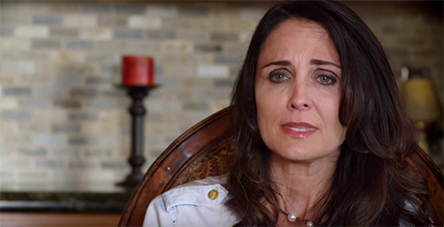 The unseen “Reconciler” brings people together who have grievances. Not just ordinary grievances, but hate-filled issues. They have seven days (until the food runs out) to work these differences out, or, well die. Meanwhile, the police are trying to find this “kidnapper” and the local newpaper — run by a guy name Russ (Roddy Piper) — puts a skeptical reporter, Laurie (Sherry Morris) on the case. Soon more “victims” enter the story, including a team of bickering detectives who find themselves trapped in a life-and-death situation. 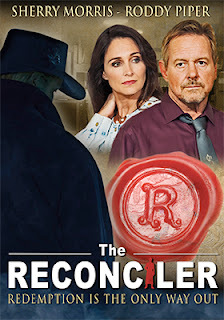 The Reconciler is a clever presentation on the subject of forgiveness. And if you’ve seen other faith-based films on the subject, you can understand how deadly dull they can become as the preaching can become overwhelming. That’s not the case here as the “message” is delivered in a much more dramatic, and even thoughtful manner; refreshing. Icarus Films will be teaming with Bullfrog Films on Feb. 28 for the double-disc DVD debut of documentary filmmaker John Pilger’s Utopia. This no holds barred look at poverty and deeply rooted social issues facing the Aboriginal peoples of Australia is not his first exploration of this subject. 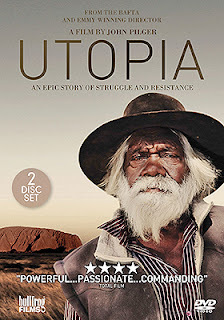 He documented the plight of the Aborigines in 1986 with The Secret Country and return to the subject — from a sports point of view — in 1999 with Welcome to Australia. In the 30 some years since The Secret Country the poverty, the living conditions and the treatment of the Aboriginal population, in Pilger’s assessment, has not changed all that much. Disease, crime and health issues, including suicide, are endemic and, despite Australia’s overall economic wealth, seem insolvable. 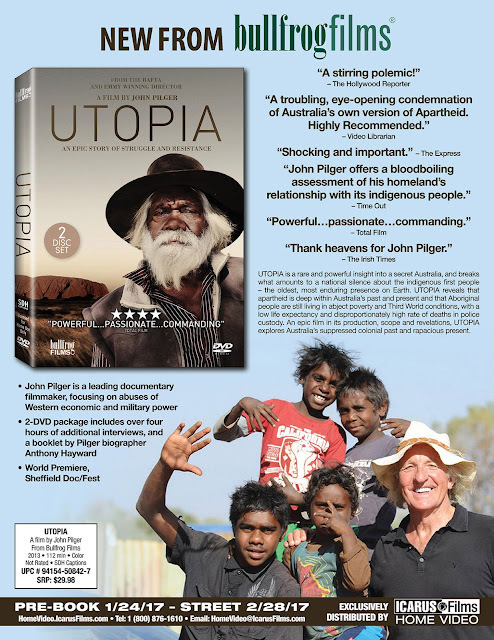 As a bonus to the Utopia documentary, Icarus Films and Bullfrog Films are providing a second disc that features over two hours worth of additional interviews, providing the viewer with additional information on what amounts to a national disgrace for the people of Australia. 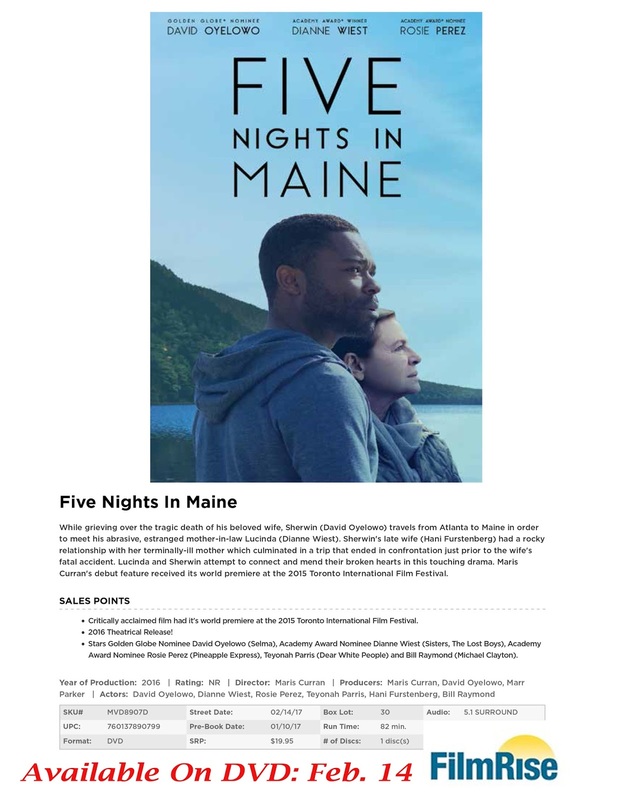 FilmRise, with sales and distribution expertise provided by MVD Entertainment Group, has tabbed Feb. 14 as the DVD debut date for writer/director Maris Curran’s Five Nights in Maine. The film played the festival circuit (beginning with the Toronto International Film Festival in September of 2015) for a solid nine months (to good buzz) before getting a limited arthouse theatrical break in early August of 2016. The ARR is 193 days and ticket sales were $15,138. Grief, unrelenting sadness … a life lost and the aftermath of that loss is what Sherwin (David Oyelowo — Queen of Katwe, Selma, Rise of the Planet of the Apes, etc.) tries to cope with. With the loss of his wife, Fiona (Hani Furstenberg), as the result of a tragic auto accident, his world has come unglued. Indeed, during the early narrative we find Sherwin, an Atlanta native, unable to deal with the loss. Even the funeral arrangements seem to overwhelm him; his ability to get through any given day is a test. 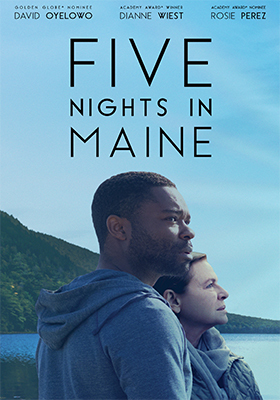 So when Lucinda, his estranged mother-in-law (played by Dianne Wiest), invites him to spend some time with her in rural Maine he jumps at it. Perhaps an escape, perhaps closure … just some time to change things; to heal. The issues between Sherwin and Lucinda are only hinted at. Perhaps it was the mixed racial marriage and all of the social pressures inherent with that. Or, perhaps it was the distance between her home in Maine and the home that her daughter had made with Sherwin in Georgia. There is nevertheless a tension. This is compounded by Lucinda’s health. She is dying of cancer; terminal. Perhaps she too is looking for closure … closure with her daughter as embodied in Sherwin. Although they share their love for Fiona — in different ways — that connection seems to elude them during the early going. Throughout Five Nights in Maine there is this “itch” that can’t quite be scratched as both Sherwin and Lucinda try to resolve their mutual loss. Look at it as something of a dance of compassion, with steps to this waltz learned only through patience. Sony Pictures Home Entertainment has tabbed Feb. 14 as the street date for Oscar-winning filmmaker Ang Lee’s latest film, Billy Lynn’s Long Halftime Walk. Planned for delivery to the home entertainment market place on that date are DVD, Blu-ray and 4K Ultra HD/Blu-ray Combo Pack (with a 3D viewing option) editions. Despite the prestige of the Ang Lee name, the film failed to generate more than arthouse interest (home entertainment to the rescue) with 1.7 million in ticket sales. The ARR is 95 days. Bonus features include deleted scenes and four featurettes. 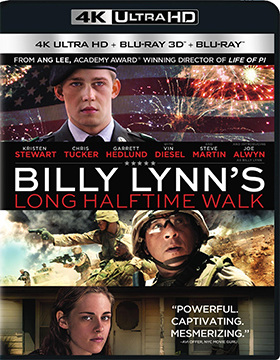 Exclusive to the 4K Ultra HD SKU is a video session with filmmaker Ang Lee. Walt Disney Studios Home Entertainment made its first product announcement for the New Year and it follows pretty much in the footsteps of those from 2016 … there is still no 4K Ultra HD commitment for the release to the home entertainment market of its recent theatrical blockbusters. 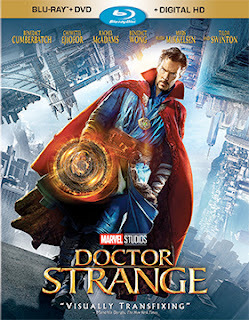 The latest example is writer/director Scott Derrickson’s latest addition to the Marvel Studios pantheon of “super heroes,” Doctor Strange. This film seemed like a natural for 4K Ultra HD, but consumer choices on Feb. 28 will be limited to a stand-alone DVD and a pair of Blu-ray/DVD Combo Pack SKUs (one with and one without a 3D viewing option). The ARR works out to 116 days and domestic ticket sales from the film’s pre-Thanksgiving launch currently stand at a robust $230.3 million.